Our 4-wheel-drive expert shares his best tips for those who are heading off road in a new 4x4 truck or SUV for the first time. A stock 4x4 right off the showroom floor is a capable trail machine that will help you enjoy four-wheeling while you learn the basics. If you just bought your first 4x4, congratulations! But if you’re new to the world of four-wheeling, the notion of putting that brand-new truck or SUV at risk on the trail may be a bit intimidating. It needn’t be. Even stock 4x4s are very capable machines, able to take you miles off the highway without breaking a sweat. However, a few simple, common-sense tips are all you need to get started in this exciting hobby. 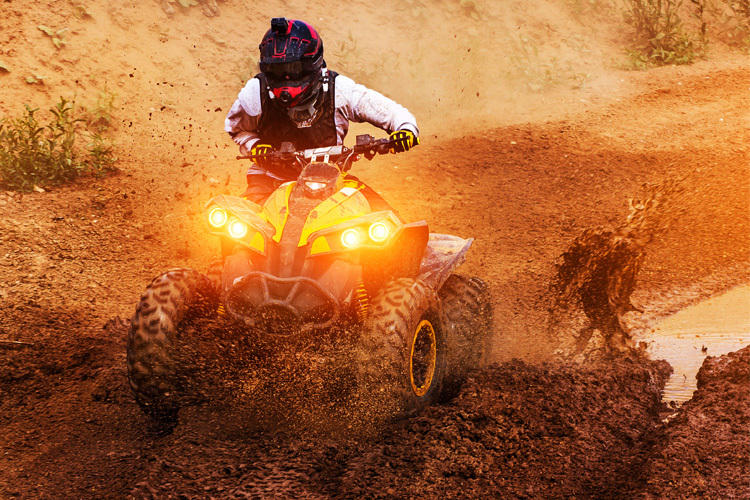 As your experience and confidence grow, you’ll find yourself exploring farther off the beaten track, and really getting the hang of what four-wheeling is all about. 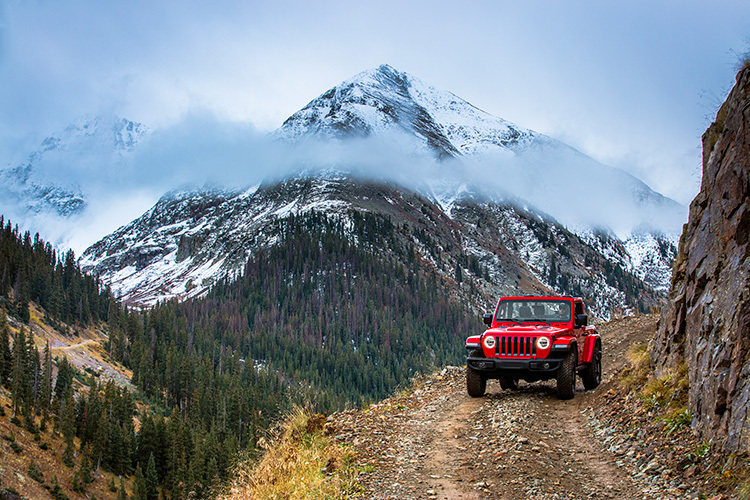 Read on to learn about your 4x4, how to drive it in a variety of terrain conditions, and what to pack for your off-road adventures. 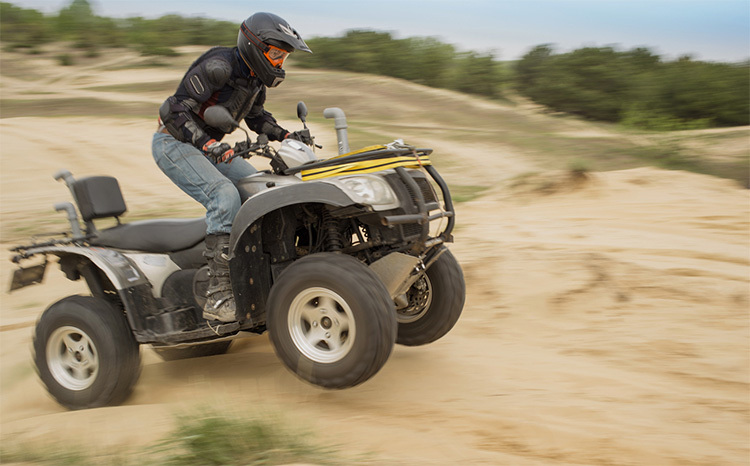 All-terrain tires, like this Goodyear Wrangler DuraTrac, offer knobby treads and biting edges on the sidewalls to enhance traction in most kinds of terrain. New-truck ads talk a lot about power and torque, but it’s those four black donuts between you and the trail that can make or break an off-road excursion. 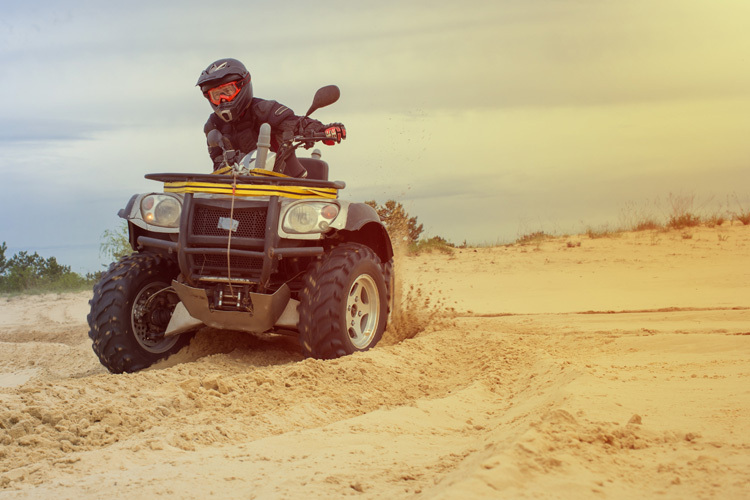 Four-wheeling is all about traction, so your new 4x4 should be equipped with all-terrain tires with deep, knobby treads that will find purchase even in loose soil, and tall sidewalls to cushion the ride over trail obstacles. 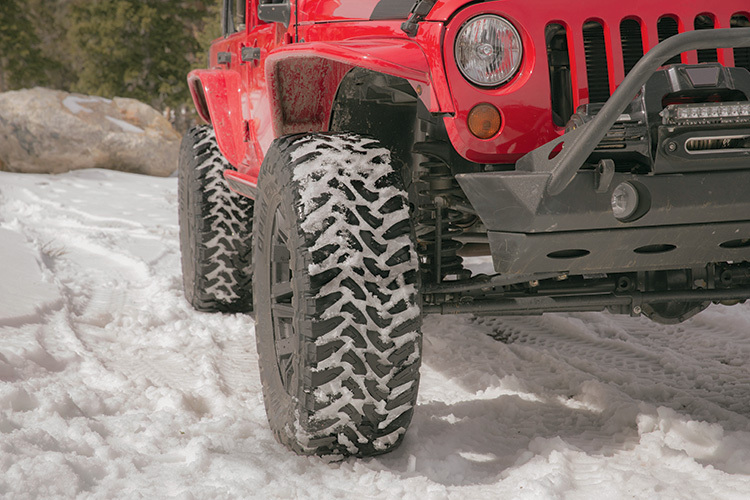 If you plan to drive in a lot of mud or snow, upgrade the all-terrains to mud-terrain tires that have tread blocks that are even more aggressive. Lowering the air pressure in your tires by 10 psi or so can improve traction a couple of ways: widening the tire’s footprint (called “flotation”) keeps it from digging into soft ground, and softening the tire allows it to mold around obstacles to grip them. Be sure to air the tires back up once you’re back on pavement, as underinflated tires generate heat that can damage the tire. A 4x4’s tires do more than just scrabble through the dirt. Carefully placing them between your vehicle and an obstacle minimizes sheetmetal or undercarriage damage. Big rock in the trail? Put a tire on it rather than straddling it. 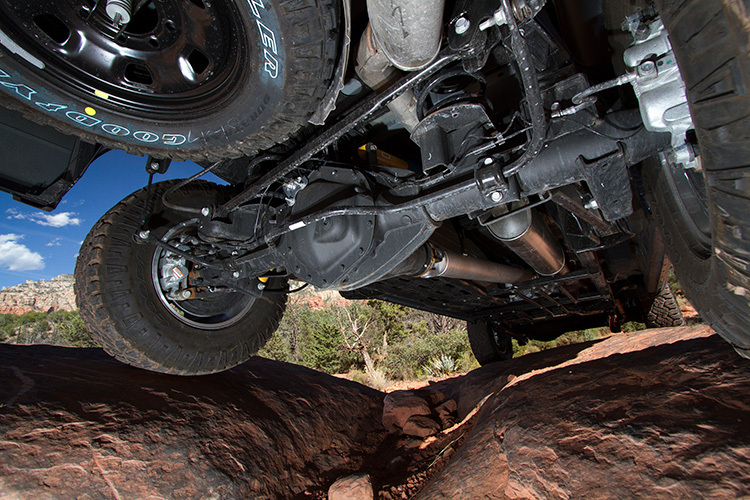 Before you head off pavement, look under your 4x4 to get an idea of its ground clearance. A spec chart may tell you there’s eight inches or so between the truck’s lowest point and the ground, but having a visual reference of what that actually means, and where the low points under the rig are, will help you avoid hitting them on the trail. 5. Note The Overhang: While you’re under there, take a look at your 4x4’s front and rear overhangs, also known as its “approach” and “departure” angles. These angles are formed by imaginary lines drawn between the ground, the front tire, and the lowest hanging part of the vehicle. Essentially it’s the area ahead of the front tire (approach angle) or behind the back tire (departure angle) that can make contact with an obstacle without that obstacle hitting the vehicle. Many SUVs, like the Jeep Wrangler, have short overhangs at both ends, giving them great approach and departure angles. Pickup trucks typically have terrible departure angles due to the length of their cargo boxes. Photograph Courtesy of Toyo Tire U.S.A. Corp.
For more demanding traction situations, like mud (and snow), a mud-terrain tire, like this Toyo Open Country M/T, may be needed. 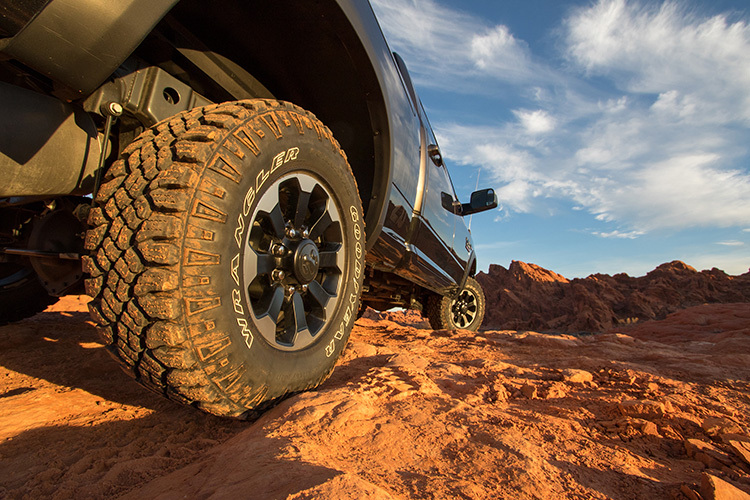 Mud-terrain tires have more aggressive tread patterns with larger open areas between the tread lugs to help them self-clean. The button, lever or dial that engages the 4x4’s transfer case is what sends power to both the front and rear wheels. 4 High (4H on some switches) engages the axles at both ends; 4 Low (4L) introduces gear reduction to multiply the engine’s torque going to the wheels, so the 4x4 has an easier time tackling tough terrain. A transfer case with a 4-Auto setting means there are clutches or a differential in the case so it can operate in 4WD on pavement without binding the driveline—a good call for inclement weather conditions. Engage 4WD as soon as you leave the pavement, and experiment with both High and Low range to get a feel for what works best on a particular type of terrain. Just remember to go back to 2WD when returning to the pavement. 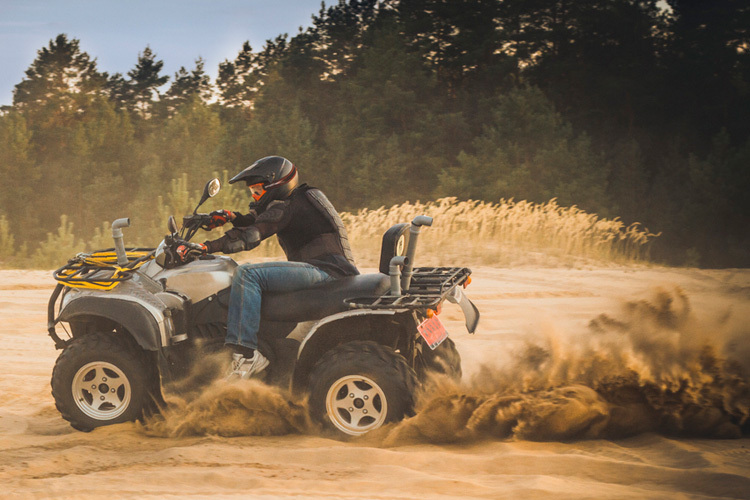 Unless your 4x4 is equipped with some sort of limited-slip or other traction aid in the differentials, what is called four-wheel drive is actually just two-wheel drive, with power going to one wheel in back and one in front. The reason has to do with the differentials, which allow the wheels on either side of the truck to travel at different speeds while cornering. It’s a good idea to learn which wheel is driven at both ends, so you can better plan your approach to a slippery situation. As you seek more challenging terrain, there are aftermarket upgrades that are easy to add and will enhance your 4x4’s capabilities: bigger and/or more aggressive tires, firmer (or adjustable) shock absorbers, body armor (bumpers, bars and rails that protect vulnerable sheetmetal), extra skid plates, traction aids and a winch are the most popular. Learning about your 4x4’s capabilities includes getting a good idea of its ground clearance, to prevent hitting vulnerable undercarriage components on rocks and other obstacles. Note this Ram pickup comes from the factory with a cage-like skid plate beneath its transfer case. Literally. Unless you’re racing in the Baja 1000, off-roading is not about speed. A leisurely pace allows you to enjoy the outdoors and relax behind the wheel, and gives you plenty of time to read the trail ahead and plan where you want to go. There’s an old saying about driving off-road: Go as slow as possible and only as fast as necessary. If you have zero experience driving off the pavement, don’t start out on gnarly, rated-nine-out-of-10 trails. Find graded dirt roads in your area to get the feel for how a vehicle, even a 4x4, slides around on loose surfaces. Work up to more challenging terrain with as you gain wheel time. It’s easy to fixate on whatever is right in front of you on the trail. A better strategy is to look ahead so you can plan your approach. If you can’t see the trail ahead—what’s past the crest of a steep incline, or the depth of a stream crossing, for example—walk the route. Sometimes trails veer sharply one way or another at their crest. Likewise, streams are notorious for hiding deep holes that swallow 4x4s. Neither is a fun surprise. In tricky terrain, a buddy or fellow 4x4 driver on the trail can guide you across an obstacle that you can’t see from inside the cab. Be sure to return the favor. Especially in very loose or slippery conditions, like mud and sand. Don’t stop until you’re on firmer ground to reduce the risk of getting stuck. Note “momentum” is not “speed.” If you need to park, position the 4x4 with its nose pointed downhill to make it easier to get started again. 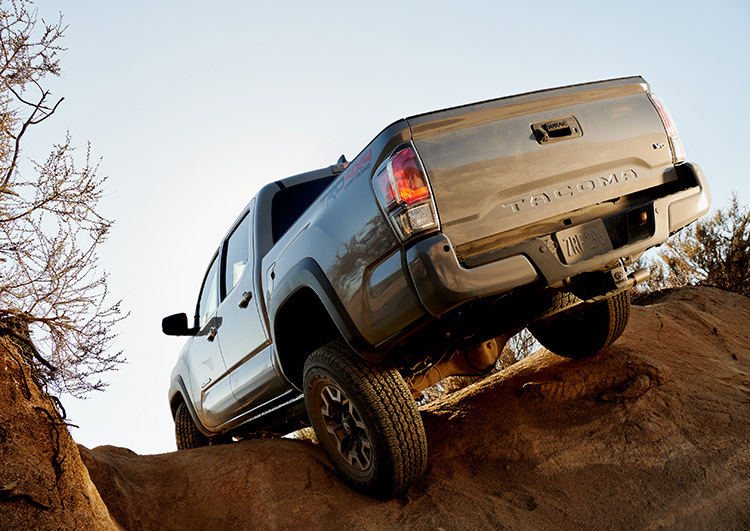 Photograph Courtesy of Toyota Motor Sales, U.S.A., Inc.
Once the front of your 4x4 has cleared an obstacle, remember the rear-end has to follow it. Because of their cargo beds, pickup trucks can require extra care to prevent dragging on ledges and rocks. 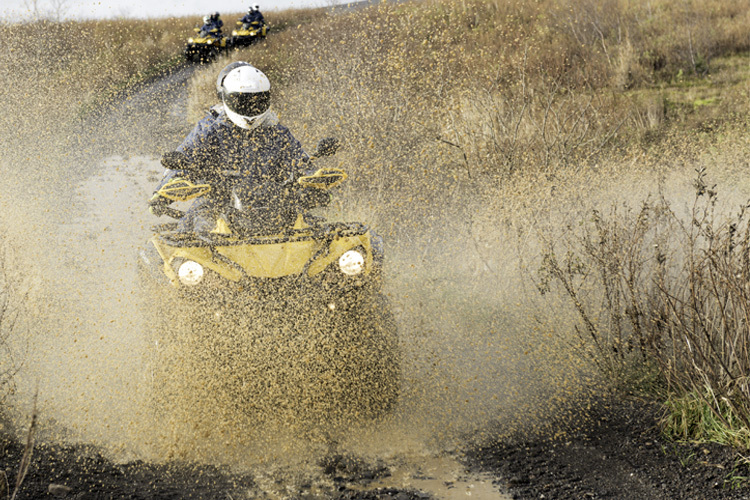 Do Stay on Marked Trails: Off-roading isn’t done in wilderness. Minimize your impact on the land by sticking to the roads and trails designated for vehicular travel. Ford streams only where they cross the road. Drive over, not around, obstacles so as not to widen the trail. These and more tips are available from Tread Lightly!, which promotes responsible recreation on land and water. Do Go with a Buddy: Whether it’s a companion in the cab or in another vehicle, there’s safety in numbers on the trail. A buddy can spot you over tough obstacles, tug you out of a stuck, and get help if needed. Leave No Trace: Leave the area you’ve traveled in better condition than when you found it. Pack out your own trash and pick up other trash you come across. If you made a firepit, bury it. Don’t Drive Over Your Head: Expert-rated terrain is for expert four-wheelers. Nothing spoils a day (and your new 4x4) faster than toppling off a rock or into a deep mud hole. Trails are rated as to their difficulty level, sometimes with a number, others with colored shapes. (Green circle? Yes! Black diamond? Not yet.) Those difficult trails will still be there when you and your rig are ready to tackle them. When traveling over a deeply rutted trail, straddle the ruts when you can to help maintain traction and so your front wheels don’t just follow the ruts automatically. If there’s no room to straddle, drive up on the rut edges, again to help maintain control. After you’ve successfully negotiated the front of your 4x4 over an obstacle, don’t forget to take as much care with the rear end, too. This is especially true for pickup trucks, which have longer (and more vulnerable) rear overhangs than SUVs do. 18. Don’t Spin The Tires A spinning tire is not getting any traction and won’t move you forward. It will just dig in and get stuck. If a wheel is slipping, let off the accelerator pedal. Try again with lighter pedal pressure. Still spinning? Stop, back up and take a different line on firmer ground. A spinning tire is not getting any traction and won’t move you forward. It will just dig in and get stuck. If a wheel is slipping, let off the accelerator pedal. Try again with lighter pedal pressure. Still spinning? Stop, back up and take a different line on firmer ground. 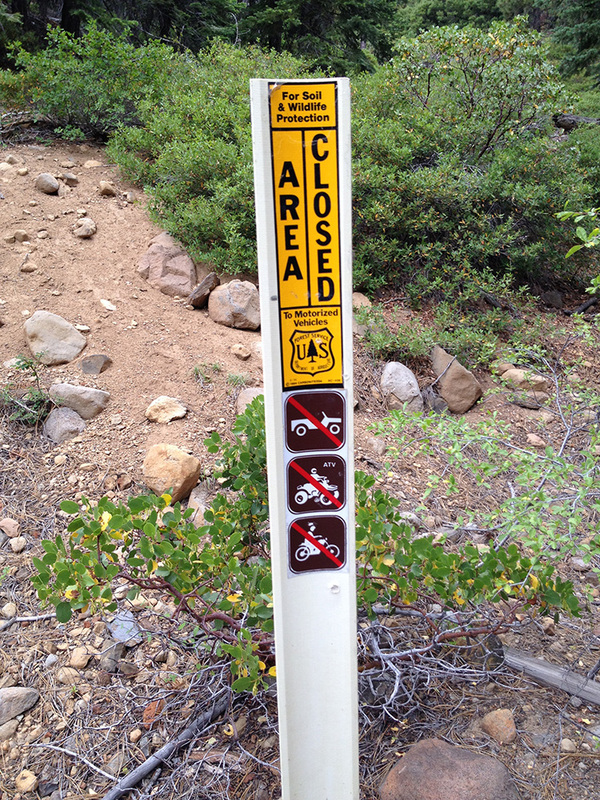 Signs posted at trail heads will indicate the trail’s level of difficulty. They will also alert you to trails that are closed for rehabilitation, washouts, or other reasons. In some situations, like when driving through mud or up a hill in loose dirt, if your front wheels start to spin you can find traction by turning the steering wheel back and forth. That allows the tire treads and the biting edges of the sidewalls to look for purchase. Driving a 4x4 in snow is similar to driving in sand or mud as it’s a surface with very little traction. Momentum helps to keep from getting stuck, as does the wider tire footprint from lowered tire air pressure. All driving inputs—accelerating, braking, steering—should be applied gently and smoothly. Popular 4x4 upgrades include bigger tires and wheels (for better traction and ground clearance), though they will often require a suspension lift to clear them. This Jeep has been outfitted with a 2-inch Sport Suspension system from Rancho. Make sure your 4x4 is in top operating condition. Check fluid levels (including fuel) and air pressure in the tires. If your rig is a year old, it may be time to change the wiper blades. Seems old-fashioned with today’s smart phones and GPS, but not all off-road trails show up on those electronic programs. A paper map will come in handy if you get turned around in the outback. As with any outdoor adventure, check the forecast for signs of bad weather approaching while you’re out. A dry dirt road can quickly become an impassable muddy quagmire in a downpour. Let folks at home know where you are going and when to expect you home. If trouble arises and you don’t have cell service to call for help, they can send help your way. Stop at the local ranger station to inquire about any issues where you’re headed: trail washouts, areas closed for rehabilitation, and so on. Local officials are also a good source of trail maps and wildlife guides. A winch is another popular 4WD upgrade to help pull you—or a buddy—out of a stuck. 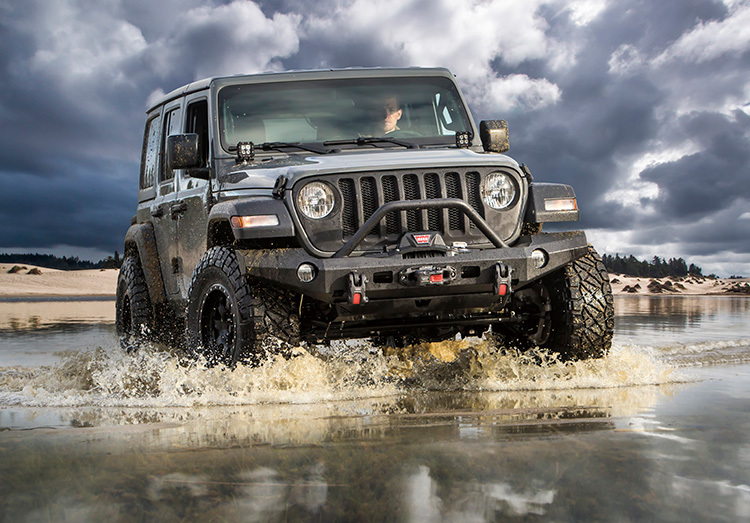 Note that this Warn winch is mounted in a Warn Elite Bumper, which provides protection for the Jeep’s front end and grille as well as mounts for auxiliary lights. At least a gallon per person per day, more for higher altitudes and hot weather. Purchase an inexpensive gym bag or duffle that you can toss in your 4x4 every time you go out. It should have a flashlight and spare batteries; cell phone charging cord and/or battery pack; multi-tool; tire pressure gauge; work gloves; energy bars, nuts, or some other calorie-rich snack; and a first-aid kit. Prepare for the eventual stuck (it happens to everyone) by packing one or more of these recovery tools: A tow strap will allow a buddy’s rig to tug you free; traction mats for under your rig’s tires (floor mats will work in a pinch); high-lift jack; and a shovel. The next step is to mount a winch on your rig and bring along the related gear in a winch bag. (Read more about recovery options in 5 Things to Have When You’re Really Stuck. In addition to the multitool in your gear bag, pack tools that will help you cope with the terrain you’ll be traveling in, such as a collapsible shovel if you’re headed to the sand, or a saw to clear fallen branches in a forest. Pack extra clothes with local conditions in mind: A rain shell, fresh socks and extra shoes for wet weather; gloves, a stocking cap and heavy jacket for cold; a wide-brimmed hat, shorts (and sunscreen!) for hot months. About The Author: Drew Hardin’s work in automotive journalism began while he was still in college in the late 1970s. After a 14-year stint at Petersen Publishing, where he was Editor of 4-Wheel & Off-Road and Sport Truck magazines, he transitioned into a freelance career, covering topics that range from vintage hot rods and classic muscle cars to 4x4s and green vehicles.